BOGOTA, Colombia (AP) -- The Trump administration imposed sanctions Tuesday on a Venezuelan media magnate close to President Nicolas Maduro's government for allegedly being the ringleader of a graft network that stole $2.4 billion from state coffers through corrupt currency deals. The action by the U.S Treasury Department gives Raul Gorrin and his business partner Gustavo Perdomo one year to divest their shares and control of Globovision in order to lift sanctions against Venezuela's largest private broadcaster. Globovision is among 24 companies and entities whose U.S. bank accounts will be frozen and barred from doing business in the U.S.
"Regime insiders have plundered billions of dollars from Venezuela while the Venezuelan people suffer," Treasury Secretary Steven T. Mnuchin said. "Our actions against this corrupt currency exchange network expose yet another deplorable practice that Venezuela regime insiders have used to benefit themselves at the expense of the Venezuelan people." Prosecutors in Miami indicted Gorrin last year on charges of paying millions in bribes to senior officials in Venezuela's treasury for contracts to buy dollars at the highly overvalued official exchange rate. He then would allegedly resell the hard currency on the black market, turning a huge profit overnight. Treasury said Gorrin plowed the earnings into yachts, horses, private jets and a number of luxury properties in Miami and Manhattan. He also allegedly invested funds for other high-level officials, including Supreme Court chief justice Maikel Moreno, and used the proceeds to buy gifts for first lady Cilia Flores. Gorrin, Perdomo and Globovision didn't respond to a request seeking comment. The actions against Gorrin come as international pressure is building on Maduro, who is preparing to be sworn in Thursday for a second, six-year term considered illegitimate by the U.S. and more than a dozen regional governments. In the run-up to the inauguration, which the U.S. has said will consolidate Maduro's path to "dictatorship," opponents have been urging even stronger action from the Trump administration, such as a ban on oil purchases from the OPEC nation or designating the Maduro government a state sponsor of terrorism. A senior U.S. official told The Associated Press that some sort of oil embargo remains under active consideration, as it has for months. The official, who spoke on the condition of anonymity for lack of authorization to discuss policy options, added that that there is increasing scrutiny of the Maduro government's alleged ties to Colombian rebels in a lawless, gold-rich area of southern Venezuela. Maduro has accused the Trump administration of plotting with his opponents and conservative allies in Latin America to oust him from power by sabotaging an economy hurt by widespread food and medical shortages, as well as seven-digit inflation. "The arbitrary measures taken against individuals really don't worry us," Vice President Delcy Rodriguez, one of dozens of high-ranking Venezuelan officials previously sanctioned by the U.S., said at a press conference. For example, on Saturday, the network aired a pre-recorded cooking show as the head of congress delivered a defiant speech against Maduro to kick off a new legislative session that several anti-government web-based broadcasters carried live. Targeted along with Gorrin were Perdomo, his brother-in-law, and their wives. Also sanctioned was Claudia Diaz, a former nurse to Hugo Chavez who went on to become Venezuela's treasurer, as well as her husband, a former bodyguard to the late socialist leader. Both are under house arrest in Spain fighting extradition to Venezuela on corruption charges. Among the Gorrin and Perdomo-owned or controlled assets blocked by Treasury are 18 entities in the U.S., including a Dassault Falcon jet and Gorrin's insurance company, La Vitalicia. 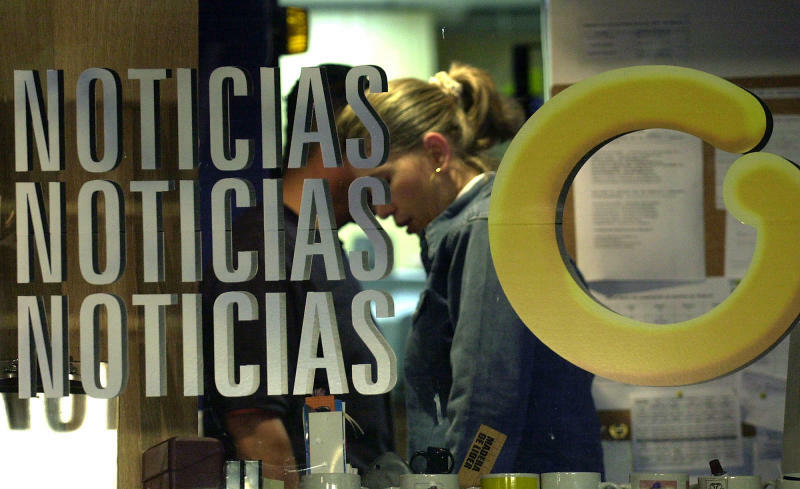 Under a special exemption being granted Globovision and its Miami-based affiliate, the network will be allowed to carry out some otherwise prohibited transactions for up to a year. Permanent sanctions relief will only come once Gorrin and Perdomo divest their holdings and give up control of the channel. Separately, prosecutors in Miami are investigating Gorrin in a case accusing multiple government-connected businessmen of laundering $1.2 billion from Venezuela's state-run oil company PDVSA. Matthias Krull, a Swiss banker cooperating with prosecutors in the case, said in sworn testimony that Gorrin, who is identified in court papers as "Conspirator 7," introduced him to men identified as "Los Chamos" — Spanish for "the kids" — whom two U.S. sources said are the children of Flores from a previous relationship, and thus Maduro's stepsons. "The United States remains committed to holding accountable those responsible for Venezuela's tragic decline, and will continue to use diplomatic and economic tools to support the Venezuelan people's efforts to restore their democracy," Mnuchin added.